The new version of our first application - 1.2 - includes JVx 1.0. We replaced the old JVx version with the new one and used the APIs. The current version of WebUI - 0.10 - supports JVx 1.0. Our showcase application already uses WebUI 0.10. Our Showcase application is up-to-date! We have updated all libraries to the latest versions. The source files are available here. 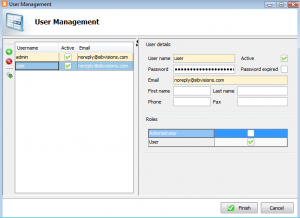 Use admin as username and password. JVx 1.0 is out and we have some Source Code statistics for you! Hm... we thought that we reach 100.000 LoC with JVx 1.0, but we "only" have 97.454. Compared to the features of JVx, we have still too few lines of code. Maybe we should use a code generator or Object Mapper or simply integrate a bunch of new features? Absolutely fine! Very easy to maintain. The test result is not perfect but we are happy with it. We should nevertheless pay more attention to the test coverage... and we still need a solution for automatic UI tests. We proudly present JVx 1.0! What a year... The first release of VisionX is out, and we finished our work on JVx 1.0. This release is awesome. It contains a total of 230 changes to 0.9. Our original Roadmap for 1.0 had fewer Features, but thanks to the community, JVx 1.0 now contains a lot of wonderful things. We think it is also time for more WebUI... maybe another implementation... let's see. And of course, mobile devices are still very interesting. We started first attempts with Android some months ago. We made some POCs with Pivot and JavaFx 2.0 and who knows what the next year brings. And we have still a lot of new ideas to speed-up the development time. Without JVx 1.0 you develop as fast as possible - but with JVx 1.0 you develop with the speed of light. You find the complete list in the Changelog. MySql and PostgreSql have some useful custom datatypes. Enum is one of them. MySql has a Set datatype too. With a Set, you define a list of allowed values and multiple values are possible for the column (more like a n:m relation). But you should not use Set datatypes, because it makes your data model unreadable and everyone wants clean data models? With JVx 1.0 it is possible to use Enum or Set datatypes. On UI side you get a link cell editor (dropdown) or choice cell editor (e.g. checkbox). Look at the image on the right. You see 3 columns. The first is a simple text column, the second is a linked cell editor (dropdown) and the third is a checkbox. Nothing special? Not until you see the database table. The server-side storage handles the enum/set detection automatically and sets the linked cell editor and allowed values into the MetaData. You don't have additional work on UI side to get above table! And this is really cool, isn't it! With 1.0 we introduce db specific storages like MySqlDBStorage and PostgreSQLDBStorage. 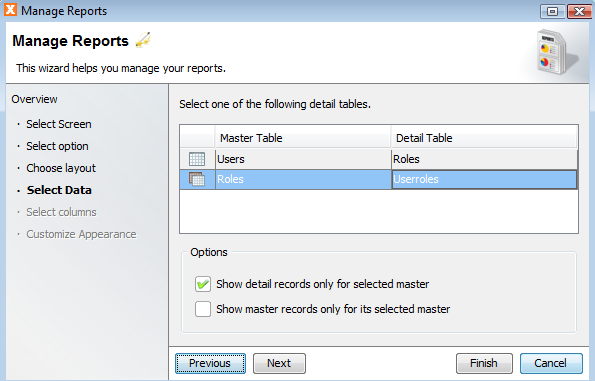 This storages support database specific features that are not standardized. We avoid/reduce boilerplate code whenever possible and who wants to change source code if the database is changed? With the new style, you get the best storage available for your database, automatically. Of course it is possible to create e.g. a MySqlDBStorage() manually, but keep in mind that you are fixed to MySql. After you changed your life-cycle objects, you get linked cell editors for your enum columns. But in many cases you use enum datatypes as check constraints e.g. Yes/No columns. In that case, a linked cell editor is not very cool - you need a choice cell editor. in the Application class. With this mechanism it is very easy to define choice cell editors for your enum types. Set datatypes are very special and generally, we don't like unreadable data models. But JVx should support it as good as possible. We handle Set datatypes like enum datatypes and we show a link or choice cell editor. The user can only select one value. A developer can set multiple values via API (as comma separated list). In the last weeks, we talked long time about VisionX Support, Tutorials and Videos. What should we use? A Forum, a mailing list, a Ticketing system, ...? We use a Forum for JVx support and think that it was a good decision because the communication works and we don't forget our tasks. So we think a Forum for VisionX related questions is also a good choice. For bug reporting, the best choice is a ticketing system and we are very happy with our Flyspray system. We don't like mailing lists. Sometimes it is comfortable to send an email and use the mail client for communication because it is in use, all the day. But online search interfaces are awful and links to mailing lists are not very cool. Who wants to read a lot of text? We don't want it. We decided to use a lot of short Howto Videos (30 seconds to 1 minute), some intro texts and a lot of screenshots. The first videos are online on our YouTube channel. Please check them and give us your feedback. With VisionX, we make it possible to create business applications without developer skills. We are often asked, how that is possible. Our answer is always the same - keep things simple and use a language that a user understands. 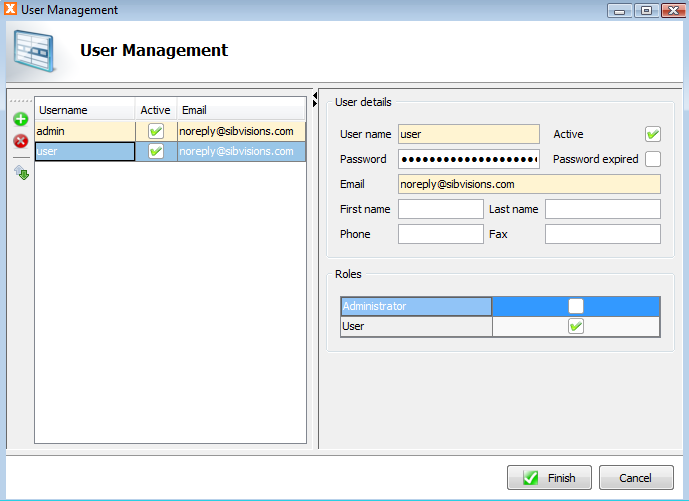 Most things in VisionX are done with wizards, because it is the easiest way to give the user an overview. 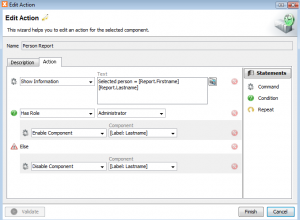 enable the access to your application! 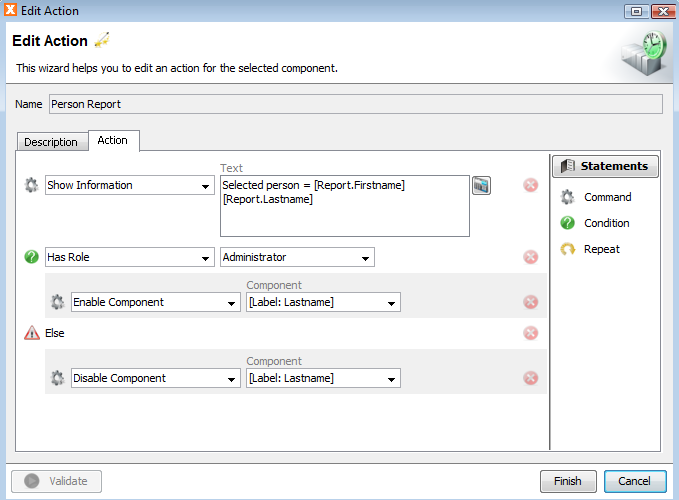 Create a standard report, change and use it. 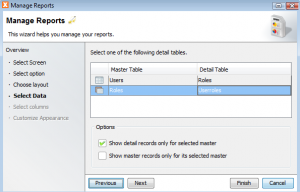 Don't learn how to use a new reporting tool, use your existing office solution!